Pilipinas Futsal | "Bringing Futsal Closer to Filipinos". TO JOIN OUR TOURNAMENTS KINDLY PRINT & FILL-UP THE CLUB REGISTRATION FORM &THE ACKNOWLEDGEMENT OF PARTICIPATION FORM. NOT ALLOWED to PLAY are: UFL, UAAP, NCAA, NATIONAL TEAM PLAYERS. 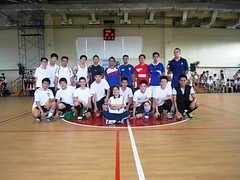 Metro Manila Futsal Association – Matchdays every Sunday. *there must always be 1 female playing on the court. This Project arose from the idea that we need more visibility & show of support for the sport of Futsal. Hence, we designed Futsal/Futbol oriented Shirts. Inorder for futsal players to wear them & be proud of loving a new & upcoming sport that Filipinos will soon learn to love & appreciate. Thank You for All your Support ! Arriba Futsalista ! Team Loyalty Should be Developed First within the Community. Football in the Philippines is still in its infancy, even though the PFF is already over 100 years old. The rise of the AZKALS has paved the way for football to again be noticed. But sustaining the increase in popularity is another bigger obstacle. In reality, there are still a few of the 100 million + Filipinos who are really passionate & loyal to football. Those who will really stick with the team through thick and thin. This is evident with the recent international games of the Azkals, there are fewer supporters in the stadiums. Yes there are many other factors, but in our opinion the reason is that the passion & love for the game is still not engraved in the peoples heart. As simply explained by a marketing manager in exaggerated version, “When the Azkals are winning, there’s a lot of support, but when they start to lose, no one cares”. 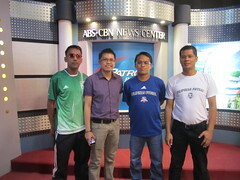 He just said it to make a point, but he also passionately wants to promote football in the Philippines. The big concern is, can we sustain the growth of football? It has been over 5 years since the Azkals became popular, these are very crucial times, for us to progress & improve more. Aside from the performance of the Azkals, there are still many more factors to address, Grassroots Development, Youth Tournaments, Professional Tournaments, Infrastructures, the PFF, Government Support, Marketing & Promotion, Sponsors etc. In Europe, the teams are formed within communities & run by people from their own community which is where you develop loyalty & passion for your club. They support their home team from when their born until they die, and they pass on the loyalty to their children. Unlike in the Philippines wherein you go to a club through, affiliation and/or from your status in life. Even at the youth level, loyalty has become a great problem. Children would transfer from one club to another, depending on their financial status and/or the level of success & popularity their parents’ want for them. You can see adults shifting from one club to another only because their new club is winning more games and/or their favorite player transferred there. Aside from the Trophies & the accolades, we cherish more the memories, the friendships, the camaraderie and the unspoken bond that we have developed through the years of ups & downs. A Futsal Club aims to become a strong football club with a firm foundation and rich history with G.R.E.A.T. VALUES. G-odliness, R-espect, E-xcellence, A-mbitious, T-ogetherness. Being Futsal advocates, This is another reason why we are pushing for Futsal to be aggressively promoted within the communities. Aside from the many reasons why we believe futsal is the best grassroots & football development program for the Philippines. 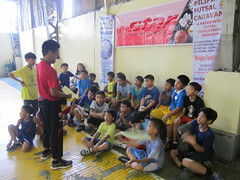 Futsal brings the sport closer to ordinary Filipinos. Ordinary people who do not have the time & resources to go to the football fields to see a game or even support their children, can now understand & learn to appreciate the game within their own community covered courts. They do not need to exert extra effort to show support & motivate their children in becoming better players. If you’re popular within your community, you will continuously strive more to improve, there are many great Filipino football players who are very popular in their school but are relatively unknown within their own community. A great sports development program should be able to grow, develop & help the people within their community. This should instill life-long passion & loyalty for the game plus the desire to help each other out within the community. The club should also create greater opportunities for everyone, from giving children hope to improve their lives, giving direction to young adolescents, creating alternative jobs to adults, inspiring our older people to help, and giving joy & happiness to each & everyone by having a futsal/football club to support & cheer for. This is the reason why we encourage our City & Provincial Futsal Coordinators to organize futsal clinics, seminars for referees & coaches, organize outreach programs & organize tournaments in all levels. 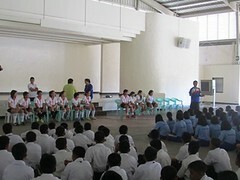 The “ONE GOAL PILIPINAS” Project. (A 10 Year Futsal Development Program) also tackles 10 different factors that should be addressed, so that the sports program will grow & develop . (“A POSITIVE ANYTHING IS BETTER THAN A NEGATIVE NOTHING”.) But we cannot do this alone, Futsal People should work together in having a consolidated & strong Nationwide Futsal Program. We should all consolidate our individual efforts inorder to make it big. We should compile, organize and coordinate our futsal projects inorder to truly make this a Nationwide Campaign. We are willing to share our experiences, hardships success & visions inorder to help you succeed in your city futsal programs. (“EVERY ACCOMPLISHMENT STARTS WITH A DECISION TO TRY”.) There will be a lot of setbacks & disappointments, but we eventually have to start somewhere. (“THERE ARE TWO PRIMARY CHOICES IN LIFE: Accept The Conditions As They Exist or ACCEPT THE RESPONSIBILITY FOR CHANGING THEM”.) Let us become a doer & do something to help our community & develop Futsal. Thanks & Arriba Futsalista ! We greatly admire the coaches/sportsmen for working hard to promote/develop and promote futsal. 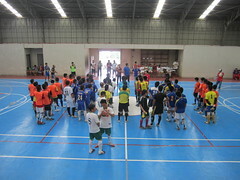 There is a BIG VOID in the development of futsal in the Philippines. Lack of tournaments, grassroots development projects, promotion & marketing etc. INSTEAD OF WAITING for the proper authorities to start something and work on it, WE SHOULD DO OUR OWN SMALL PROJECTS. In our opinion it is better for the people passionate about futsal to work and do what they can within their own capacity to promote & develop futsal. For ordinary players all you need to do is join as many futsal tournaments as you can. Then organize more futsal friendly games in your own brgy. covered basketball courts so that ordinary people will get to see more and learn more about the sport. We believe that futsal is still the best grassroots program for the Filipinos and futsal is not a threat to football but WILL COMPLEMENT THE DEVELOPMENT OF FOOTBALL. It is easier to setup tournaments & outreach clinics in FUTSAL. 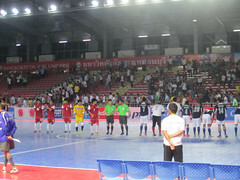 Futsal will also bring in the High Scoring Games & fast-paced-action-filled situations that Filipinos are craving for. It has been over 5 years that the sudden rise of the AZKALS & Philippine Football. Then FOOTBALL became popular in the Philippines, something older football players thought would never happen in their lifetime. But now the real battle is to sustain the growth in popularity. This is where tournaments, grassroots development projects, promotion & marketing etc. comes into play. There should be an influx of new ideas inorder to entice the sponsors and ordinary people to learn more about football. This is where Futsal can help in the development of football. 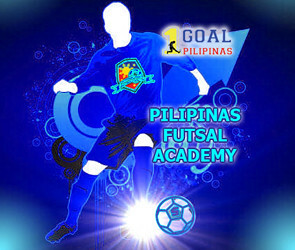 The PFA is not created to replace the Futsal Committee of the Philippines, we are just trying to fill the VOID. 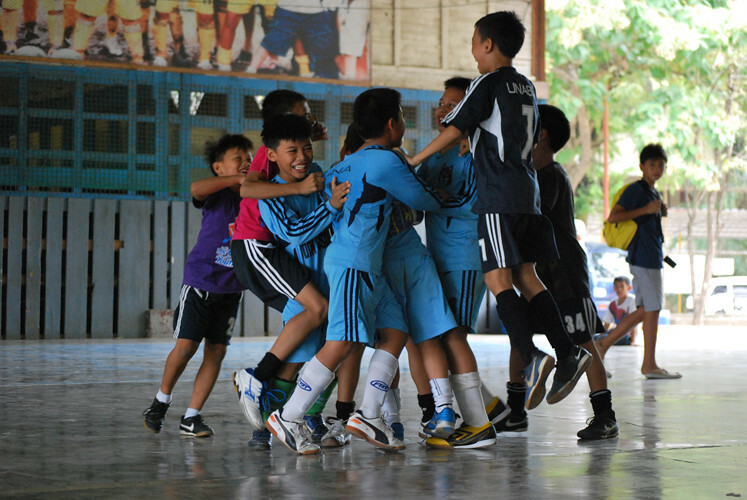 If no one starts the futsal programs, who will? Everyone can do their own futsal programs, all we ask from these people who are also passionate about futsal & football is to coordinate & consolidate our activities. If we do it alone, it will be very very hard. BUT IF WE SHOW EVERYONE THAT WE ARE UNITED & WELL ORGANIZED, THEN WE MIGHT GET LUCKY & CREATE BIGGER FUTSAL ACTIVITIES IN THE FUTURE. Arriba Futsalista ! Enter your email address to subscribe to this blog and receive FREE notifications of new PILIPINAS FUTSAL NEWS & posts by email. Outreach Programs: Kick for G.O.A.L.S. PSFAC 2016 – Metro Manila Philippine Schools Futsal Association “An Inter School Futsal League”. (HIGH SCHOOL DIVISIONS) (BOYS & GIRLS CATEGORY) (GAMES EVERY SUNDAY) JULY 10,17,24,31 u17- BORN 2000 & u15 -Born 2002 (BOYS & GIRLS CATEGORIES) AUGUST 7,14,21,28 u13- BORN 2004 & u11 -Born 2006 (BOYS & GIRLS CATEGORIES) Arriba Batang Futsalista !